We have coquelet, poussin or young chicken. I normally get birds that are under a pound, which makes them perfect single serving size. If you have larger birds you may want to serve just one for two people. You could also do the glaze with a whole chicken or chicken pieces, adjusting cooking time accordingly. For the basting sauce: melt butter in a small saucepan; add lemon, soy, rosemary, and pepper. 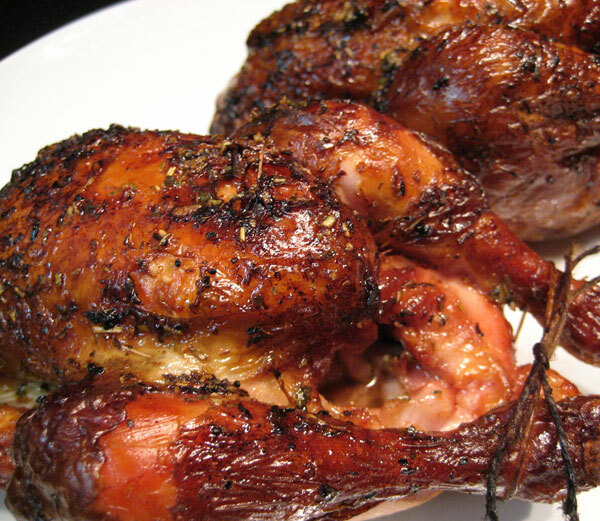 Cook hens on barbecue grill over indirect heat for 45 – 60 minutes, depending on size or until done. Chicken is done at 160 F (70C) on your meat thermometer and/or the juices run clear when pierced with knife. During last 20 minutes of cooking baste with sauce 4 – 5 times. It ended with a whisper, not a bang, but it was time. 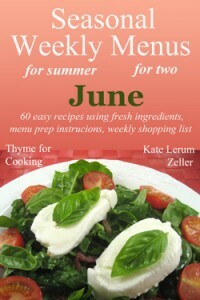 For 10 years I have done a weekly menu with recipes and shopping list.on Thyme for Cooking. When I started it was a novel idea and there was not a lot of competition on the web. Today, the number of food, recipe and menu sites is almost astronomical. Frankly, I don’t want to take the steps to stay competitive…. I don’t want to do paleo and gluten-free and vegan and fat-free and flavor-free options. I want to do other things, more fun things. I’m not abandoning it…. I’m just doing it a bit differently, in a way that doesn’t require the same level of work each week. I’ve posted 4 seasons of menus, with the recipes and shopping lists. Pick your season and get started. If you follow along with successive weeks you’ll still have the benefit of careful planning. I’ll be updating it every week, noting the ‘current’ week for those who still follow. Plus I’ll be adding new menus and recipes from time to time….. Just not every week. The change has no effect on this blog. I can stop thinking about recipes that will work with the menus and start doing more recipes just for fun. With all the bad and ridiculous things that go on in the world we should all take the time to have more fun. I still refuse to put dinners in mason jars however so don’t look for that here….. I think I’ll go play with my spiralizer now. Good Gadfry the color on those birds is AWESOME … I mean AWESOME! I hope that was fun because I too think it should ALL be fun. Good for you and I for one will still look forward to your blog! Glad you’re not leaving us for good! Like you, after several years of daily posting, I have cut back to posting only when I think I have something interesting to say or a good new recipe to share. I always enjoy your posts. I have only followed your blog – it has fantastic recipes and ideas, not just on the culinary side. I agree it should be fun because if it is not it wouldn’t be as appealing to all who follow your posts. And there is more fun to come – when you come over here – so soon too !! I read two food blogs, yours and David Liebowitz’s. I consider them equally good. I eagerly look forward to reading about your new adventures. Best wishes. Frankly, I don’t want to take the steps to stay competitive…. I don’t want to do paleo and gluten-free and vegan and fat-free and flavor-free options. I’m so glad! I don’t do blogs that feature any of that stuff (flavor-free…I’ve actually read a couple that would have ended up that way after cooking) and I do so enjoy your off-food posts as much as the recipe ones. Tanna, that’s my new motto! Gill, also true…. If I don’t enjoy writing it no one will enjoy reading it. Kate, I can’t believe how close it’s it – 3 weeks!!!! Brassfrog, funny – we started about the same time…. We need new adventures.